Was passively poking around Hackernews this evening reading a really cool thread titled: “What projects are you working on?” when I stumbled upon an answer that piqued my interest. 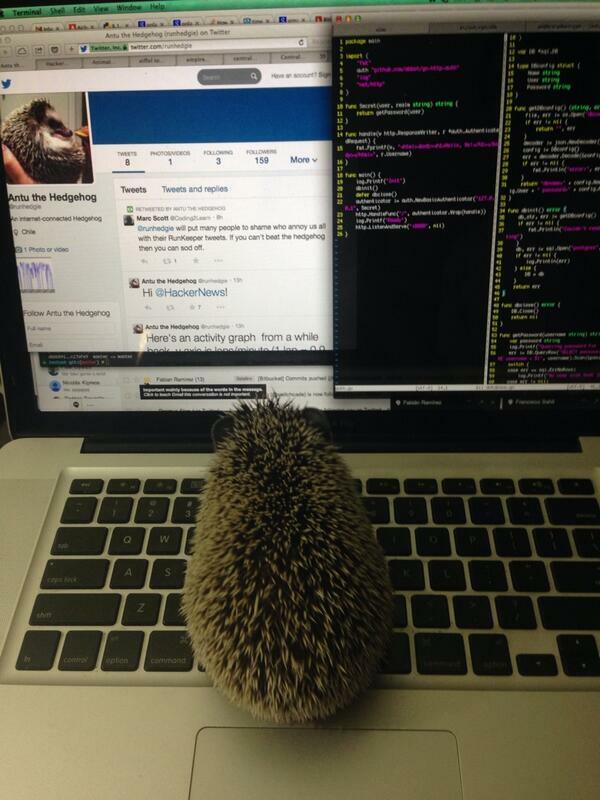 Apparently a Chilean programmer named Jose Luis Honorato took it upon himself to connect his hedgehog “Antu” to Twitter. If you are looking to see exactly how the system is setup, Jose was kind enough to write a post about it on his really wicked smart blog. He also threw all of the code up on Github. Pretty cool right? This takes a lot of talent to put togehter. It is one thing scraping together enough Python to talk to Twitter’s API,but the soldering, hardware and programming takes a lot of smarts. Well done Jose! I also had the opportunity to learn a little bit more about Hedgehogs. They are primarily nocturnal and do most of their running at night (kind of like programmers.) I also found out that they have quills kind of like porcupines, which can be kind of painful but if raised properly these little creatures can be very friendly.